Rob Hodgson is an illustrator and designer with a deep interest in how and why we make pictures. He lives in Bristol with his girlfriend and two highly intelligent cats. Writer Aidan Onn was born in the UK but grew up in Hong Kong. After returning to the UK to study design and film, he settled in London, where he still lives. 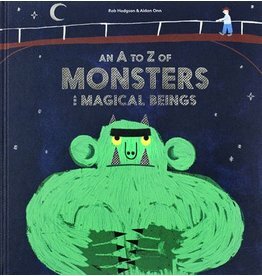 A fantastic, original exploration of a collection of weird, wonderful, and scary monsters from all over the world. Suitable for children 4+.